With a passion for rare beauty and the remarkable talent to find it, Elke Berr is not only recognized the world over for her ability to find extraordinary stones, but also for her original yet timeless jewelry incorporating these amazing gems. To learn more about this globetrotting gemologist and jeweler, we caught up with her recently in Sri Lanka. Globetrotting gemologist and jewelry designer, Elke Berr. Ring in 18K gold with a 10.24-ct Paraiba tourmaline and diamonds in the Iris collection. Vivid orange-red 5.42-ct spinel center stone with diamonds set in 18K gold. Ring in 18K gold set with a 4.65-ct Royal Blue Burmese sapphire and rose-cut diamonds in the Icy collection. Burmese 3.03-ct red spinel ring in 18K gold with purple sapphire and diamond accents in the Dharma collection. A 26.99-ct opaline agate is surrounded by tsavorites, sapphires and diamonds set in 18K gold, from the Earth on Fire collection. "Purple’s Charm” ring with an 11.62-ct natural Burmese purple spinel, amethysts, pink sapphires, diamonds and 18K black gold. Pendant made with various shades of green tourmaline set in 18K gold with diamond accents. 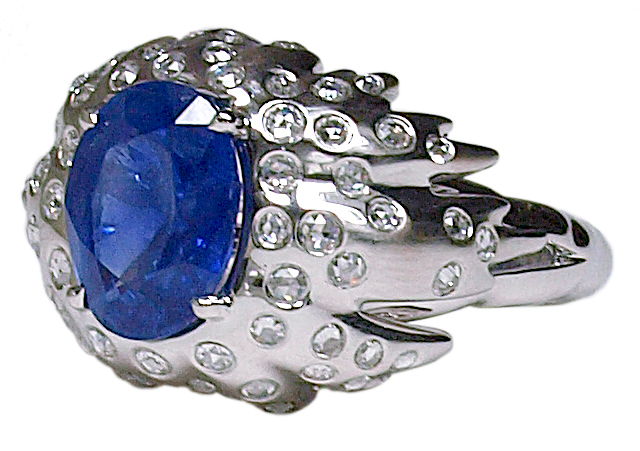 “Life’s Elixir” ring with an 11.81-ct natural Burmese Royal Blue sapphire, diamonds and 18K gold. Cufflinks in carved rock crystal, mother-of-pearl and diamonds set in 18K gold. Q: What made you decide to go into the gem business? Elke Berr: My fascination for gems started in Sri Lanka when I went there at the age of 17 to buy my very first stones, with pocket money, to illustrate my thesis for the German Maturity diploma, entitled “The journey of gems: From the mine to the hand of a beautiful woman.” The only person I could sell my stones to was my grandmother, so I decided to learn more about them and how to mount them in jewelry. Some years later, with studies and practical experience in hand, I opened my own company, Berr & Partners SA, with my husband, Thomas, in Geneva, Switzerland. Q: And now you are again in Sri Lanka. Do you also travel to other exotic locations, to find unusual stones? Elke Berr: Yes, traveling is a large part of our business since we source directly from the mines in very remote corners of the planet, as well as trading with dealers around the world, who have become friends over the years. We look for one-of-a-kind gems, such as unheated sapphires, rubies and spinels from Sri Lanka and Burma, tourmalines from Brazil, emeralds from Colombia, and unusual agate opals and Paraiba tourmalines from Africa. I also enjoy hunting for gems with private individuals as well as opportunities at auctions and shows. Q: What is your favorite gemstone? Q: What brings you to Sri Lanka this time? Elke Berr: As an ICA member, I came to attend the ICA Congress conference and mine tour. The ICA events are always interesting and afford the opportunity to meet new members as well as local gem dealers. I also came to find large and rare blue sapphires for my clients, which I can happily say that I did. Sri Lanka is not only a good source of these beautiful gems, but it's also an amazing country with kind and warmhearted people. After all these years, it is very emotional to return to Sri Lanka and see Ratnapura again, where my passion for colored gems started. Q: What is your view regarding the global gem trade and the need for transparency and ethical standards? Elke Berr: In order to have consumer trust, industry players must be transparent and deal ethically, not only with their customers downstream, but also with their suppliers upstream. These best practices are a part of our daily business transactions. Aside from business, we also try to make a difference in the lives of those in need. And, I feel it is important to share our knowledge of gems and the industry with other people. Q: Could you be more specific about making a difference? Elke Berr: One of Burma’s [Myanmar] most famous mining areas is Mogok, not widely open to visitors. We were among the few to be granted access to this mythical mining region many years ago. As a result, we have come to know many of the miners and their families. One of the ways we are making a difference in the region is by providing support for a multi-religious and multi-ethnic orphanage that allows children to be raised by volunteer “mothers,” who receive funds to take care of them. This allows the children to get an education through secondary school. I invite anyone who goes to Mogok to visit the Grace Haven orphanage and see the wonderful work they do. We also support Voix Libre, a Swiss organization working to prevent children from working in the mines in Bolivia. Q: Are you also involved in commercial partnerships? Elke Berr: Because of our knowledge of antique jewelry and high-value gemstones, we are sought after by banks, investors and insurance companies that rely on our expertise in “art banking.” We have also partnered with Dukascopy Bank, a Swiss forex bank, where we promoted gems in mini-seminars on their TV channel, in addition to sponsoring the Miss Dukascopy contest. We also provide seminars and training for watch and jewelry brands on gemstones because I believe that education is primordial for our business. 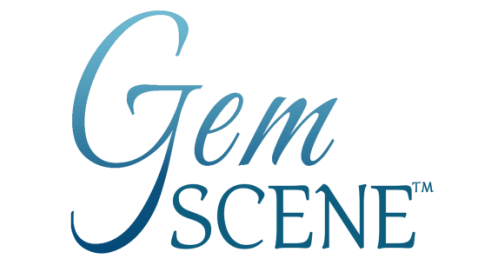 Q: After developing your deep knowledge of gemstones, you branched out into jewelry design. How did that happen? Elke Berr: I expanded into jewelry in 2006, with the launch of ﻿Elke Berr Creations Genève﻿. I wanted to capture the beauty and mystery of rare gems in exquisite jewelry. And, I also create modern, more affordable lines with unusual cuts. Among the affordable lines, in addition to feminine jewelry, is a men’s collection of cufflinks, using carved rock crystal and diamonds. I also create different lines to be sold in retail stores in different markets. Elke Berr: Our limited-series collections, incorporating rare and often one-of-a-kind gems, are sold through the world’s most prestigious retailers and to collectors who purchase them for both their design qualities and as investments. It is amazing to think that these wonderful jewels will be passed down for generations. High quality gems are becoming scarce and, as a result, prices are rising along with demand. Q: Can you tell us something about your custom-made pieces? Elke Berr: Custom is a large part of our work. Many clients request a specific gem and then ask me to design a unique piece of jewelry around it. Among the many bespoke pieces is a spectacular ring made with a 33.9-carat unheated Burmese star ruby set in 18K black gold with black and white diamonds. A French television channel made a documentary about it entitled Dream Stones, which has already been distributed to 15 countries. Others include a 15.69-carat rutilated Paraiba tourmaline set in 18K gold with diamonds, and a 4.65-carat unheated blue Burmese sapphire ring. Q: Can you give us a sneak preview of your next collection? Elke Berr: After the successes of my previous collections, Icy, African Flame, and Mogok, I am now launching my newest, called Might & Magic: Immersion in a Precious and Enchanted World. With it, I create real alchemy between exceptional Burmese rubies, sapphires and spinels set in gold with diamond accents. This collection unites gemology and design and comprises four lines: Life’s Elixir, Jouvence’s Fountain, Love’s Potion and Purple’s Charm. Along with a certificate from a recognized laboratory, each piece is an ode to life and love for the discerning woman, the woman who has a love for gems. Elke Berr travels the world in search of rare and precious gems. Here she talks with miners at a sapphire mine in Sri Lanka. Elke Berr examines rough gems at a mine in Mogok, Burma. Among the precious stones sought by Elke Berr around the world are rubies, emeralds and sapphires. Very rare 33.9-ct natural Burmese ruby set in 18K black gold with black diamonds. A television documentary featured this exceptional ring. 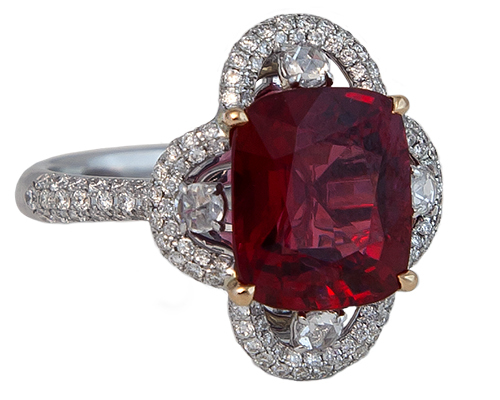 “Love’s Potion” ring made with a 9.01-ct natural Burmese ruby, diamonds and 18K gold. From the Rosea collection, a 7.14-ct pink spinel with diamond accents in 18K gold. One of the ways Elke Berr tries to make a difference in the lives of others is by helping support the Grace Haven orphanage in Mogok, Burma. Ring with a tanzanite center stone, surrounded by diamonds in 18K gold. Moonstone center stone surrounded by black and white diamonds in 18K gold.